Dermatophytosis is a contagious fungal disease among animal communities. The major concerns of dermatophytosis are cost of treatment, difficulty of control, and the public health consequences. The objective of the present study was to compare the clinical efficacy of Sumaq and Neem extract cream with that of traditional treatments, eniloconazole and glycerine iodine, on dermatophytosis in Arabian horses. For this purpose, 37 Arabian horses with dermatophytosis had been used. Fungal isolation and identification for each horse were carried out by standard microbiological procedures. Sumaq (Rhus coriaria Linn.) and Neem (Azadirachta indica) seed extracts were selected based on in vitro effectiveness. Horses were randomly allocated into four groups. The first group (n = 8) was treated with glycerine iodine 10% daily for 7 days. The second group (n = 10) was treated using eniloconazole 10% emulsified concentrate four times with 2 days interval. The third group (n = 11) was treated with Neem seeds extract (20% cream) daily for 10 days, and the fourth group (n = 8) was treated with Sumaq extract (5% cream) daily for 10 days. Clinical and mycological evaluations were assessed at 0, 7, 14, 21, and 28 days post-treatment. The Sumaq and eniloconazole were more effective on clinical index score after 7 days of treatment followed by Neem seed 20% cream. At 28 days post-treatment, a complete healing was obtained by Sumaq 5% cream and eniloconazole (median clinical sum score = zero) followed by Neem (median clinical sum score = 1.5). Moreover, Dermatophytes spp. was isolated only from two horses, one from Neem group and the other from glycerin iodine group. The present results indicate that Sumaq 5% and Neem seed extract are effective alternative treatment for dermatophytosis in Arabian horses. 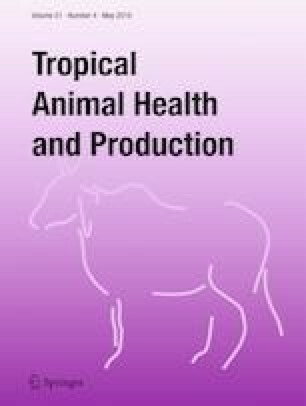 This study protocol was approved by the Committee of Animal Welfare and Ethics, Faculty of Veterinary Medicine, Mansoura University, Egypt.